How much does a Jet Ski & Trailer weigh? Jet Ski’s and their trailers come in different sizes and weights. Since there are so many options it can be hard to give an exact number for how much they weigh. You probably need to know if your car or truck can tow a jet ski, right? The good news is that many manufacturers will tell us how much a certain model weighs. Just keep in mind that this weight is without gas in it so add some more pounds to it. Don’t forget about the gear weight too! 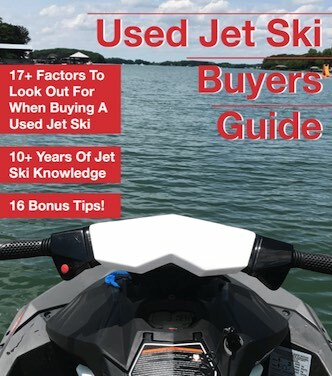 What if you don’t know what jet ski you want to get? And you just want to make sure the vehicle you have now can haul it? A jet ski whether it’s a Sea-Doo, Yamaha, or Kawasaki come in many different weights. The lightest weighing watercraft is the Sea-Doo Spark and it comes in around 450 pounds. The heaviest watercraft can weigh as much as 1,100 pounds! The average I would say is about 850 pounds per Jet Ski give or take on fuel and other things you’ll carry. An interesting thing about the weight of a Jet Ski has some relation to how much it cost. The more expensive the watercraft becomes the more it weighs. The Spark is the lightest watercraft on the market and it’s also the cheapest! While the GTX Limited S is the most expensive Sea-Doo and also is the heaviest Sea-Doo too! For a worst case scenario if you wanted to get 2 of the heaviest watercraft you can expect both together to weigh about 2,500 pounds – but that does not include the trailer. If you got 2 of the lightest (also the cheapest new) Sparks you could expect about 900 pounds for both of them without a trailer. Just like Jet Ski’s, the trailers come in different sizes and weights too. Also, you need to decide if you want to go with a single, double, or even 4-place trailer. Tip: If you’re going to get a trailer and have the option of a Triton Aluminum Trailer then get it. Sea-Doo, Karavan, and many others make trailers and they work just fine. But I always have the best luck with Triton Trailers. I find that the Aluminum trailers like the Triton’s are lighter and hold up better to rust. Also, make sure you get a Trailer Jack like this one to make moving the trailer a lot eaiser. Here is a link to Triton’s Spec Sheet for Jet Ski trailers. A Triton Single can weigh as much as 195 pounds while a Triton Double can weigh about 320 to 365 pounds. So if we have 2 of the heaviest watercraft on the heaviest Triton Double Trailer (Elite WCII) It can weigh about 2,900 pounds. If you go with another trailer that is not aluminum this weight can go beyond 3,000 pounds especially when you add fuel and gear. If you got the two lightest Sea-Doo Sparks on a Triton Double (LT-WCII) it would put you at about 1,200 pounds give or take when you add fuel and gear. If we say the average jet ski weighs 850 pounds and you got two of them on an LT-WCII that would weigh about 2,100 pounds give or take for fuel and gear. If you got the cheapest Sea-Doo Spark on a Triton Wave Trailer it would weigh about 650 pounds give or take on fuel and gear. For good measure – if you have an average weight watercraft on a Single Triton Trailer (LT-WCI) it would weigh about 1,100 pounds give or take for fuel and gear. This should give you an idea of what a Jet Ski and Trailer would weigh if you got one. Make sure to follow all rated capacities of your towing vehicle. Also, make sure to get the correct tow hitch and accessories you need too. Hitch – Every car or truck needs a hitch if you want to tow. The hitch is the part that attaches to the vehicle and where the receiver connects to. Some trucks or SUV will come with a hitch on it, but if you don’t have one then you need to have one installed. Here is some hitches if you need to get one. Receiver – After you get the hitch you’ll need the Receiver. The Receiver is where the tow ball is attached to and plugs into the hitch. Make sure to get the Receiver that is the correct size to your Hitch. Ball – The ball is what the trailer connects to and latches to. You usually have 2 sizes when it comes to trailer balls and jet ski trailers. You have the most common 2 inch ball and you also have the 1 7/8th ball. Not sure which one to get? Get both, here is a ball receiver combo with both ball sizes. Receiver Lock – You may lock your trailer down at the coupler but it’s nothing for a thief to unlatch the receiver and plug that into there truck and drive away with your trailer. With a receiver lock like this one here you can keep that from happening. Light Adaptor – You know the number 1 thing most of my customers would forget to buy when picking up their new Jet Ski on a trailer? The adaptor for the lights. Jet ski trailers use a flat connector and most cars built within the last 10 years use around light connector. In most states, you need lights if you want to be legal and they panic and start to scramble. The solution is simple, just get a trailer light adaptor like this one. 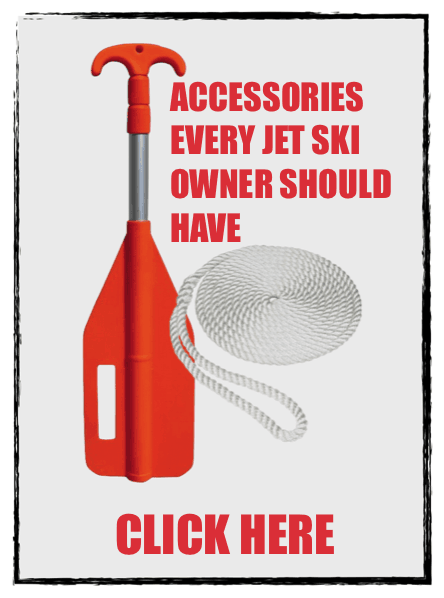 Check out many more Jet Ski Accessories Here! Can a Car Tow Jet Skis? With the proper hitch and accessories, most cars can be adapted to tow a watercraft just fine. But you must be very strict about tow capacity when it comes to a car since it can’t tow as much as a truck. 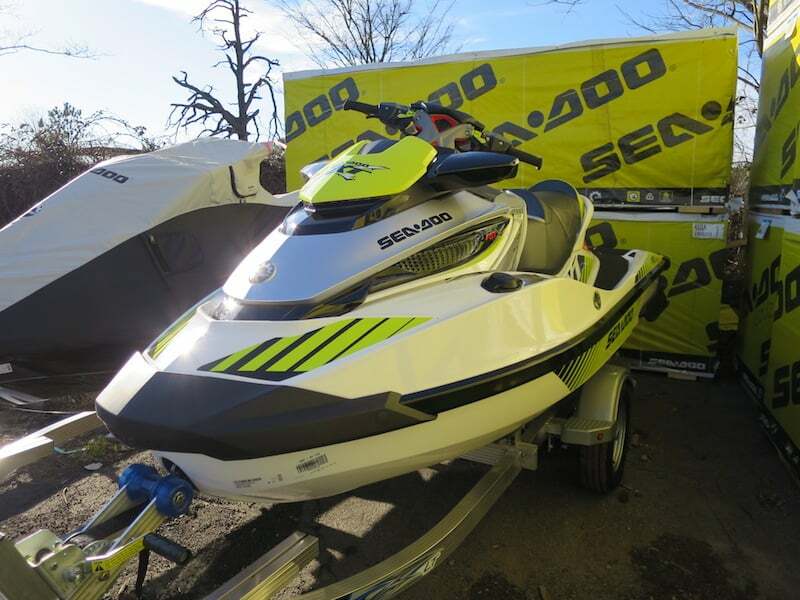 If you have a car and want a Jet Ski or a pair of Jet Ski’s then the best option is to either go with a Sea-Doo Spark or a Yamaha EX since they’re the lightest watercraft on the market. Sea-Doo even has a video showing them towing a pair of Sparks behind a Car. I even seen customers tow a single spark behind their Prius and Mustang before. The reason why its so important to follow your cars recommended towing capacity has to do with braking and getting out of ramps. If you haul something too heavy then your car might not be able to stop correctly and people can get hurt. Another factor is that ramps you’ll use to launch your watercraft can be steep and a too heavy of a load can make it impossible to get out of the ramp. Or even worse the load could pull your car down into the water and sink it! This is why it’s important to follow the towing capacity of your car or truck! If you do go with a Sea-Doo Spark then check out the Spark Double trailer. This trailer is made for 2 sparks and works just perfect if you have a car! I recommend the Galvanized version since it holds up better to rust. Backing up a jet ski trailer can be hard, especially if its a single trailer. Or hooking up to the trailer is super hard if you don’t have a back up camera. To make backing up the trailer easier you can buy boat trailer guides. These guides are made for boats to guide them in from the water, but if you get long enough ones it also allows you to see where your sides are when backing up. Plus, it helps with loading the ski too as it can keep the rear from swinging away when you’re trying to load up. As for hooking up to the trailer you can get hitch rods like this here. These things allow you to line up your truck to the trailer and remove the guess work. Did you know many trailers you buy won’t have a Tongue Jack? A Tongue Jack is needed if you want to easily get the trailer off the ball of your truck. There are many other accessories you should look into getting for your Jet Ski trailer. I have a list of the must-have trailer accessories here. Thanks…very informative. One question; Is there a way to know the tongue weight based on the weights you’ve given here? The weights given in the post are not exact numbers, they can vary depending on the watercraft. The tongue weight can also vary too and there is no exact number to give. On my trailers, I like to have 10 pounds of tongue weight but everyone and every trailer are different. If anything, I like having a heavy tongue than a light one to keep bouncing from happening. To help with the weight of the tongue I get a Tongue Jack which saves the back. As a general rule, always assume the trailer is tongue light when approaching it. I’ve been smacked and trailers noses flung up in the air because the trailer was light when got on it or took it off the ball. Better to be safe than sorry.